My experience here, was absolutely wonderful. Patricia was very helpful and very patient. From walk in to departure, I may have been there for 20 minutes. I was prepared to be there a lot longer, so having to only spend a fraction of the amount of time that I allotted, was nice. I had no complaints and all my questions were answered to my satisfaction and in a very up front and not shady manner. I was completely satisfied and would definitely recommend them to others. Patricia was a godsend. . .
Place was clean! Prices were competitive! Natalie was very friendly and very helpful! NATALIE WAS WONDERFUL. SHE GAVE US A TOUR OF THE PLACE. SHE WAS VERY FRIENDLY AND VERY HELPFUL. I WOULD RECOMMEND THIS PLACE TO EVERYBODY I KNOW. HELPED US TO GET THE RIGHT SIZE OF UNIT THAT WE NEEDED. SHE IS ALWAYS SO FRIENDLY WHEN I SPEAK TO HER. THANK YOU SOOOO MUCH NATALIE. Don't go anywhere else! This place is great! I unexpectedly needed a storage facility. So I did my usual research and planned to go to 2-3 places before committing to a location. I walked in and was greeted by Natalie. She was very sweet and knew the business inside and out. She gave me a tour of the different sizes and options. I finally decided on a 10x20 regular unit and a 10x15 climate controlled unit. The prices were too good to pass up! Very pleasant experience. They were very helpful. Their prices are competitive and reasonable . I would recommend to my friends. Nancy and I are very impressed wihth Armored Self Storage. The people are very helpful, courteous and friendly. This place is a clean safe place. The prices are very competitive. I highly recommend to anyone. Everything about this company is Great! First off let me say Natalie is Awesome! She has a great big personality & puts me in a better mood every time I see her! But, from day one, this company has been great from securing a moving truck for me & calling to let me know of a possible leak in one of the units near mine. I've never had a problem with my unit. Very clean. & I've even referred my family to them! I reserved a unit online and received a call from the office less than an hour later to say hello and guide me through my next steps. I met the manager at the office, and she was very friendly and helpful, and answered all my questions. I was very, very pleased! The manager Natile is the best people's person I've seen in a while, armored should be proud to have her. Natile is very knowledgeable about the position she holds and take pride in the company. Staff was very pleasant and friendly! They really care! I don't believe I have ever seen a storing place so clean and kept nicely as this one. Everything always looks so crisp and clean. Awesome service 5 stars by far! Natalie was prompt and friendly and took care of me. Thanks. Absolutely the friendliest service ever!! Natalie was very helpful and considerate and tried her best to accommodate all my requests. Excellent customer service, Extremely Knowledgeable and personal. I chose this place for location as well as great customer service! Wonderful renting experience. Randy is a credit to Armor! We called and talked to 3 or 4 storage facilities before renting from Armor. They were by far the friendliest and were ready for us when we arrived. In-fact, they made unloading and paperwork simple! A+ from this happy customer. Thank you Andy. We appreciate you storing with us and the great feedback on Randy and our facility. Great Service!! Mr. Evans is wonderful! Keep up the Good work!! Would gladly give them 5 1/2 stars... great customer service! Always a smile which is great! Great place to have your storage. I tell everyone... go to Armored Self Storage. Rent from Armored and you can use their truck. They treat you like family. The manager Randy is so sweet & helpful. He is like a bundle of joy when you walk through the door. Professional and friendly. Great service and clean storage unit! Great Service, Nice clean facility! Courteous and informative... overall a great experience! Everyone was awesome and helped us out all along the way. Will use again... 100% satisfied! Thank You!! Courteous and very helpful. Randy showed me to my unit and how to operate my lock set. I would recommend to my friends and anyone needing storage. They do treat you like family! Very Professional and Understanding... Thoughtful!! GREAT PLACE!!!! I would recommend to anyone needing storage! Great Place, Great Job getting paperwork done! I am very satisfied with Armored... they were very attentive to my needs. Randy is a top customer serve guy. Great people skills. I called and have a blessed feeling every since. Great family oriented company. Great place, great management and would highly recommend. It is GREAT how Armored treated us! Very Secure! Using the truck was perfect! 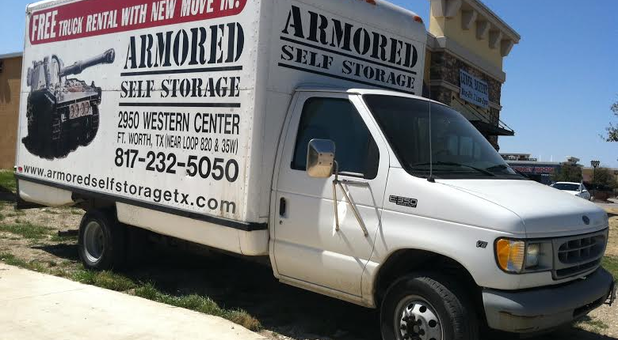 Armored Self Storage on Western Center is easy to get in and out, clean, and affordable. The customer service is excellent. I would not hesitate to recommend this storage facility to any of my friends and acquaintances. Very good treatment, courtesious and felt at home dealing with Armored Self Storage. I rented a 10x20 this morning and you can believe them when they tell you that they treat you like family! I am retired from the military's Special Forces and the facility is clean and the service is above what could ever be expected and the facility is very secure! Clean, Safe and the staff is very helpful! I store my RV at the western center storage. The best and most helpful service in all of fort worth. I highly recommend this storage center. Just the best !! !